(Photo: Reuters / Michael Prengler)Pascal Tessier, 16, from Kensington, Maryland, an openly gay scout who was facing expulsion from the Boy Scouts answers questions from the media while his mother, Tracie Felker (R), looks on after the resolution to allow openly gay scouts in the Boy Scouts of America passed in Grapevine, Texas May 23, 2013. The Boy Scouts of America voted on Thursday to lift a ban on openly gay scouts that had been in place throughout the organization's 103-year history, capping weeks of intense lobbying on both sides, the group said in a statement. A number of faith groups have reservations about the Boy Scouts of America's decision to officially admit gay children and teens to its ranks. The National Council of the Boy Scouts of America (BSA) voted on Thursday to forbid discrimination in its troops on the basis of sexual preference. More than percent of about 1,400 delegates voted to end the ban on gay youths during the National Council's annual meeting in Grapevine, Texas . The BSA ban on gay leadership remains in place. The Catholic Church, the United Methodist Church and the Church of Jesus Christ of Latter Day Saints, commonly known as the Mormons, have said that they will continue to work with the BSA despite the change. The Mormons sponsor approximately half of the BSA's faith-based charters, the Denver Post reported. The Catholic News Service said that the National Catholic Committee on Scouting will study the decision. The Catholic group said that since the policy does not go into effect until January 1, 2014, it will have "adequate time to study its effects." "The NCCS will determine how it may impact Catholic-charted Scout units and activities", the group said in a statement after the vote. "In doing so we will work within the teachings of our Catholic faith, and with the various local bishops, and their diocesan scouting committees." Evangelicals and conservative groups lamented the BSA's decision. Many believe the outcome will be a mass defection from the organization. Two denominations are recommending that their members switch to Scout-like organizations which they sponsor. Richard Land, a senior official of the Southern Baptist Conference (SBC), told the Baptist Press that churches should consider affiliating with their faith-based group called Royal Ambassadors. "Frankly, I can't imagine a Southern Baptist pastor who would continue to allow his church to sponsor a Boy Scout troop under these new rules," said Land. The Associated Press reported that Baptist churches sponsor 100,000 of the 2.6 million members of the Boy Scouts. The Assemblies of God recommended its group Royal Rangers as a "positive alternative." "Sadly, the Boy Scout's legacy of has become yet another casualty of moral compromise", said Family Research Council (FRC) President Tony Perkins. "Unfortunately, Boy Scout delegates capitulated to strong- arm tactics and abandoned the timeless values that have served the organization well for over 100 years." Perkins said that the delegates succumbed to pressure from BSA leadership. A BSA survey had showed that over 60 percent of its members opposed a change in the old policy. 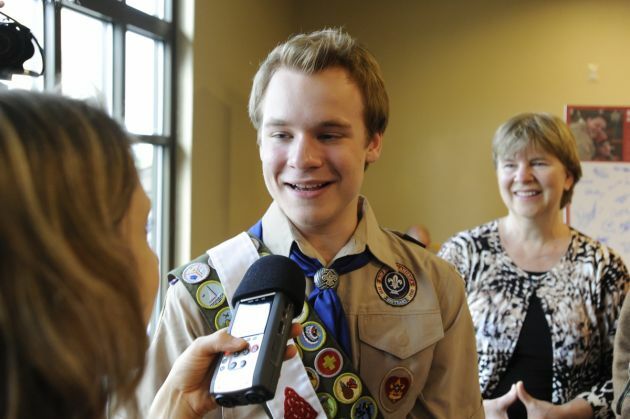 The director of the FRC's Center for Religious Liberty, Ken Klukowski, noted that the new policy will expel a Scout after their 18th birthday instead of allowing a transition to adult leadership. "This incoherent policy could lead to crippling anti-discrimination lawsuits that could ultimately ruin the Boy Scouts," he said.